Kim had a golden opportunity to win her first major in April 2012, when she stood over a one-foot par putt at the 72nd green to clinch the Kraft Nabisco Championship. The putt somehow lipped out, and Kim dropped into a playoff with another South Korean, Yoo Sun-young. Yoo beat Kim on the first extra hole with a birdie. The missed putt at the end of regulation was so shocking that the usually stoic Kim stood frozen, her mouth agape in disbelief. Kim hadn't won an LPGA title since November 2010 -- she did pick up a Ladies European Tour win in 2014 and 2016 -- and the winless drought would last until October 2016, when Kim won Reignwood LPGA Classic in China. 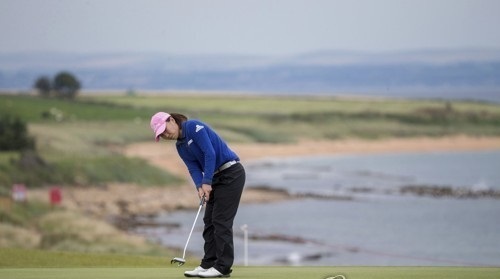 Major championships remained elusive for Kim, who, after the shocking miss in April 2012, had just three more top-10s in the 24 majors that followed until this British Open. The end of that drought in Scotland Sunday was a measure of redemption for the 29-year-old, who had her moments of struggles to bounce back. Kim turned to meditation after that gaffe. Once she realized she was being too critical of herself, Kim tried to change her mindset and put that memory behind her, so that she could start enjoying herself on the course again. I think we judge ourselves a lot, everybody does. But for our own self, I think sometimes you've got to have some self-compassion, and we can make some mistakes," she said. "But I hope that mistake will make a more positive impact in life instead of dwelling on the past. If you think about it, I think (the) present moment is more special." Kim's wide range of interests has likely kept her from dwelling too much on that mistake. Kim, who plays the guitar, is a huge fan of the Beatles. She's been wearing a ball marker with the band's logo all week and even called it her lucky charm. Kim is a voracious reader who is particularly into literature and philosophy. She also paints and has an affinity for Vincent van Gogh. Kim has additionally been among the most philanthropic LPGA players. After winning the Lorena Ochoa Invitational in 2010 in Mexico, Kim donated her entire $220,000 winnings to Ochoa's charity that funds educational programs for Mexican youth. Since 2012, Kim has been working with the Special Olympics, an athletic competition for those with intellectual disabilities, as its global ambassador for golf. After ending her LPGA drought last October, Kim has added three more wins in 2017. Kim is the only three-time winner on the tour this year, and no one has won more LPGA titles over the past 10 months. Kim was born in 1988, the same as former world No. 1s and multiple major champions Shin Ji-yai and Park In-bee. Those players and others born around the same year were collectively called "Se-ri's Kids," as they were inspired by the retired star Pak Se-ri to pick up golf. Shin and Park clearly enjoyed better starts to their careers. Kim, who has insisted she never once felt she has fallen behind her contemporaries, can now also call herself a major champion -- an unexpected one at that.